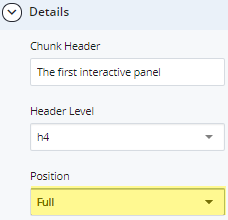 The interactive panel chunk is a panel that contains either an internal or external link. Reference the Web Style Guide for more information about interactive panels. This is the subhead of the first interactive panel. This is the subhead of the second interactive panel. This is the subhead of the third interactive panel. The header is what appears in larger, bold text. This field is text-only with no styles. The subhead is optional, and appears in smaller text. It is a text-only field that can give more context to the header. 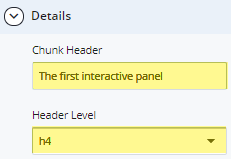 The interactive panel chunk may link to either an internal link or an external link. An internal link links to a page within your site in the WCMS. An external link links to an external page URL. Expand to Section > Chunk. Use the green [+] to add more chunks, if necessary. From the Type drop-down menu, choose Interactive Panel. Choose an option from the Position drop-down. If the panel is in a grid, leave the default selection. Enter the Subhead, if desired. Add the Internal Link or External Link. To save a draft, click Save & Preview. Submit the draft to apply changes to your page. Publish the page.